I’m sure most of you have stumbled upon bullet journaling at some point in life. Whether it was through a friend’s influence or by chance, there is no denying that it has made a pivotal impact on our lives. The reason I started bullet journaling was to find a positive outlet where I can exercise my creativity, but it had also helped me deal with my anxiety in ways that are both healthy and effective. Bullet journaling has improved my lifestyle remarkably, so hopefully you will find it helpful as well. 1. It helps organize my daily life. I get excessively anxious when I can’t visualize my day or worry about forgetting plans. If you ever feel the same way, then you should consider taking up bullet journaling! Bullet journaling is a spectacular concept with the idea of helping you organize your life, day by day. And how you execute it is entirely up to you! A once disorderly and dysfunctional lifestyle is no longer a stressor when you can plan out your days, weeks, and months beforehand. You wouldn’t have to worry about forgetting a task ever again when you can cross it off a to-do list. There’s something comforting about regaining the reign of control over your disorganized life that puts you at ease. Or maybe it’s just me! 2. It helps prioritize important tasks. Don’t you just hate it when you don’t remember to pay your bills even though you planned to pay them on time? Or maybe a neglected assignment because of an overwhelming list of things to get done? If that doesn’t cause stress and anxiety, I don’t know what else does. The great thing about bullet journaling is the many different ways to use it to the fullest. 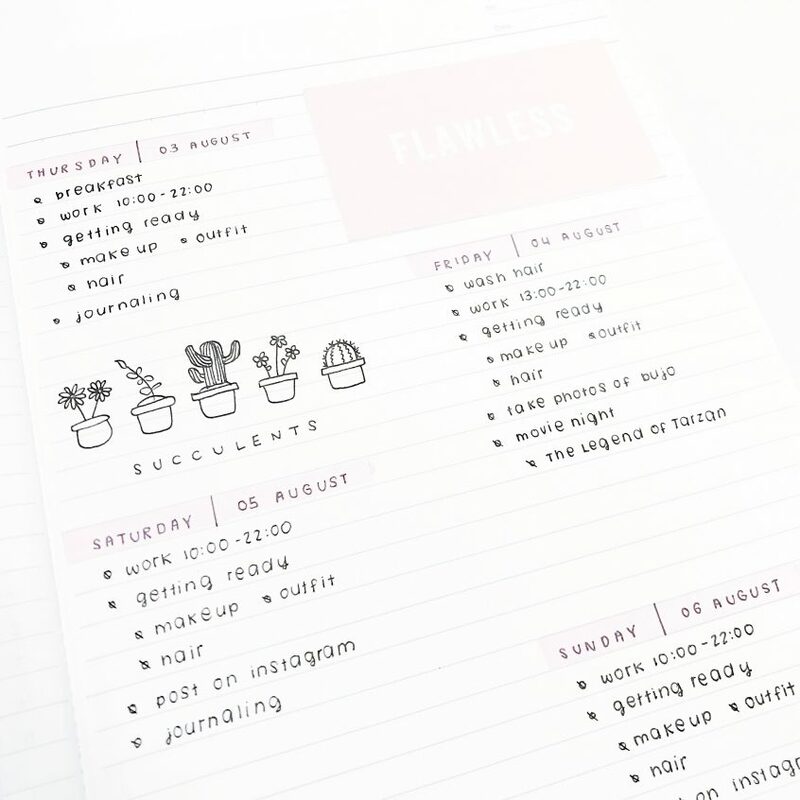 Before making your daily to-do list for the week, you can always have a blank page ready for a mind sweep where you can sit down and list out any tasks you need to get done that you can think of right off the bat. And from there it’s easier to filter out any important tasks that need prioritizing. The chances of you missing an assignment or getting overdue bills will decrease, and so will the chances of getting an anxiety attack. 3. It helps manage my time and keep me on schedule. Sometimes when you’re too preoccupied, it’s easy to lose track of time and unintentionally put yourself behind schedule. I don’t know if this stresses you out as much as it does to me, but when I get put behind schedule and have to cancel some plans or if I didn’t get to finish some tasks for a certain day, my anxiety usually gets a turn for the worst. But after making a habit tracker in my bullet journal, I find that I don’t stray from my schedule as much as I did before. Not only do I get things done and still get to enjoy scrolling through Instagram and reading fanfics online, I started adapting a more efficient lifestyle. You would be amazed with the number of things you can get done in a day without wasting too much time on distractions. 4. It helps me stay productive. There are some days where you feel worse for wear than others and maybe that might make you feel like neglecting your work. But let me just tell you this, having a bad day is tough but it won’t get better by staying in the slums. What will make you feel better and take your mind off the matter is to be productive. With every task you cross off your daily to-do list, the better you’ll start feeling about yourself. Trust me, it works! Instead of letting your negative emotions pull you down, lift yourself up! 5. It helps provide a positive outlet. I may feel like I’m in a bad place on some days. But whenever I sit down to plan in my bullet journal, I find myself able to relax and rejuvenate. I spend fifteen minutes on my bullet journal in the mornings and another fifteen at night. These are the times where I can take all my anxiety and stress and let them all out in a creative form. It’s important to find your happy place where you can escape to cope or deal with any negative emotions. The flexibility of a bullet journal is endless and serves as a perfect place to build your perfect escape. You can be as creative and decorative as you want with stickers, pictures and washi tapes, or you can find pleasure in the simplicity of your spreads with only one black inked pen. In a way, bullet journaling is like a form of therapy. 6. It helped me find a place for myself. Thanks to bullet journaling, I have found a place for myself where I can fit in. The bullet journaling community is filled with a variety of people from all over the world who shares the same passion as you do. Everyone is kind, welcoming, and unbelievably supportive. And you’ll be amazed at how easy it is to make friends! It’s never too late to join the community if you’re looking to showcase your bullet journal or to make friends! Bullet journaling may not be for everyone, but if you’re also struggling to cope with anxiety or any other form of negative emotions, then I implore you to give it a try. It has helped me remarkably in so many different ways and I’m hoping that it could be of help to someone else in need.